Raccoons have long been hunted and trapped for their fur and meat. Fur hats, known as coonskins, were once very popular in our country. Raccoons live throughout much of the United States and Mexico. Because of their fur, they have been introduced into countries in northern Europe, such as Russia. Raccoons are easy to identify. They have a black “mask” on their face, a pointy nose, and black rings around their one-foot long tails. They are the size of a small dog. Raccoons can range between 18 to 30 inches long. They can weigh up to 46 pounds. Their toes or hands are long and are used to open doors, hold food (which they will wash if there is water), and climb trees. Male raccoons will mate with several female raccoons; however, the female will only mate with one male. Mating occurs during our winter season. Baby raccoons, called kits, are born about nine weeks later in a hollow tree or hollow log. There are usually 3 or 4 kits born in a litter. At birth, they are blind and lack their masks. Females take care of the young. Kits stay with the mother through the first winter season. After that, they leave to find their own homes. Raccoons live more than 10 years. 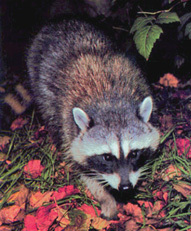 Raccoons live in many places in the wild or close to humans. They can build nests in logs, dens, empty buildings, garages, or sheds. Raccoons can be found in forests, in towns, and cities. They have bad tempers and fight among themselves. The mother is a fierce protector of her young. They live lonely lives and do not hibernate in the winter. Raccoons are more active at night. For animals, they have a large menu from which to select their food. As you would expect, they are omnivores. They swim and hunt for fish, turtles, frogs, crayfish, and animal eggs. The will catch and eat mice and muskrats. In the forests, they will eat insects, young birds or bird eggs, nuts, and fruit. They tip over garbage cans for food. They can raid a chicken house on a farm. They will eat corn and other crops. They have even been known to eat dog food!